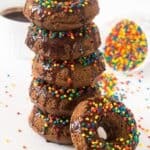 Double chocolate doughnuts – these grain free doughnuts are made with buckwheat flour and topped with a sweet chocolate ganache frosting. These double chocolate doughnuts one is for my true die hard choc-a-aholics, c’mon where are you? You need not be shy about your undying over for chocolate. I mean after all isn’t chocolate brimming with endorphins? You know that stimuli to the nervous system that evokes pleasure? Still feeling guilty? Okay, I will quit fooling around and be more serious, I’m a sucker for some doughnuts, you see I just admitted to liking them. Here in the UK we have a lot of bakeries, I swear sometimes it feels like the UK and France are in some sort of competition for who holds the monopoly on bakeries. Some people don’t realise just how fond Brits are of little bakeries and/or patisseries until they take a vacation here. 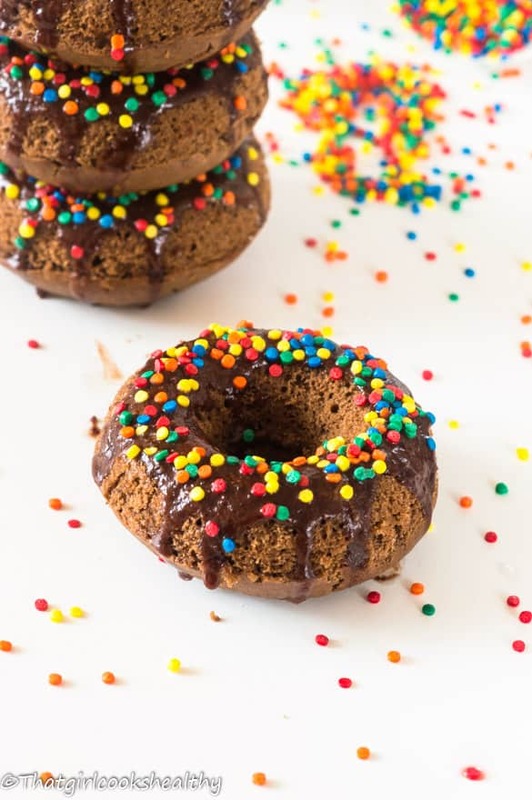 Before I delved into the more healthier side of being a food-a-holic, during my days of being a dilligent student I would often treat myself to a doughnut, for me doughnuts were a mere treat, I would never overindulge but it felt like I won the lottery whenever I did eat a doughnut or two. Despite doughnuts being my guilty pleasure I used to hold a deep disdain for their primary method cooking which was deep fat frying. Just thinking about all that unhealthy saturated fat sent shivers down my spine. I knew at some point, being a foodie I would have to tap into creating my own healthly rendition and WHAM! Check out these oven baked doughnuts to boot. 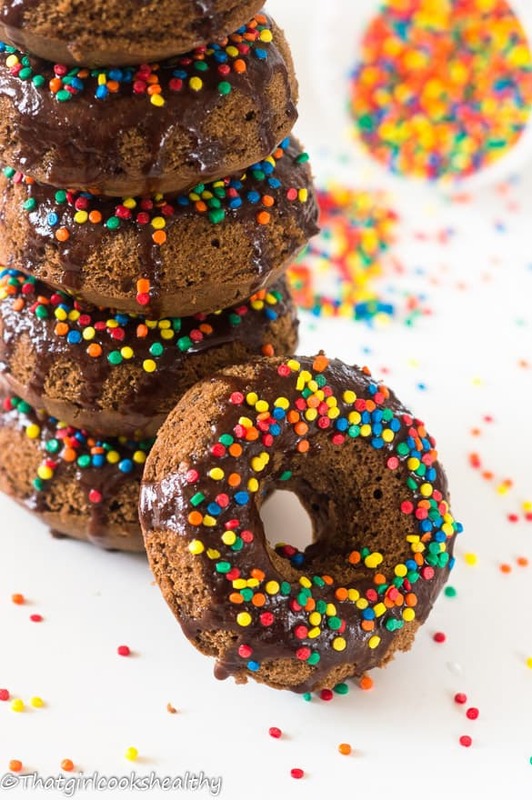 These double chocolate doughnuts are……….. They are gluten free, made with my good ole friend mr buckwheat flour, you know the flour I’ve used before to make the cinnamon pancakes and the cinnamon oven baked doughnuts? Yes that’s the one. I won’t go into the spiel about buckwheat, you guys should already contrary to what the name suggests buckwheat it’s derives from the rhubarb family – loaded with protein and is slow releasing which won’t spike the blood pressure. 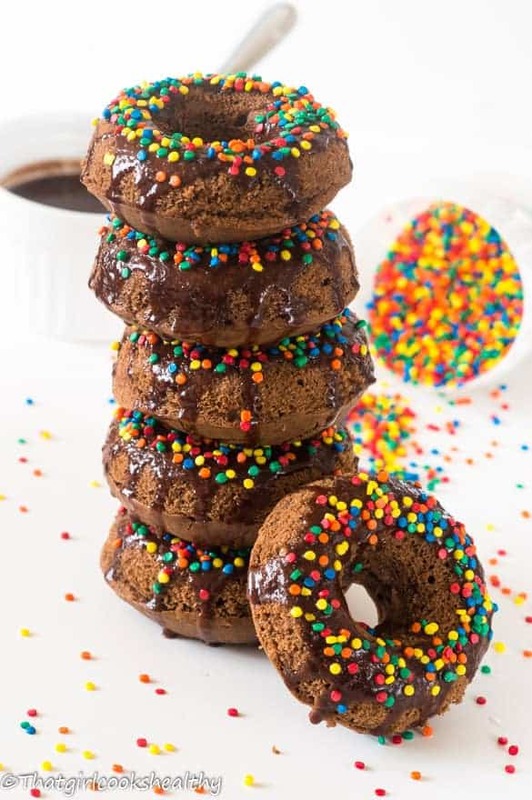 While this double chocolate doughnut recipe isn’t vegan friendly, it is free from dairy. Because these doughnuts are oven baked, you will need a doughnut to house the batter in order to bake. The chocolate ganache was successfully made using a combination of full fat coconut milk and dairy free chocolate. Also, I used my good ole trusty cacao powder for the actual doughnut, that never lets me down. The good thing about these little beauties is you can freeze them and eat at another time. The size of them are so appealing and perfect for bringing with you to work or just going about your day as a snack! Prepare the doughnut pan by coating it generously with some coconut oil. Combine all of the dry ingredients into a large mixing bowl. In separate bowls crack the egg and whisk together with the milk and coconut oil. Carefully pour the egg mixture in with the flours and using an immersion stick blender mix all of the ingredients until a smooth batter is present (use the stick blender to omit lumps). Spoon the batter into the doughnut pan, fill to 3/4 being mindful not to overfill the pan. Bake in the oven for 15 minutes, the timing may vary so check the readiness with a pick/knife around 11-12 minutes. Mine were completely cooked through by then. Once baked allow to cool for a few minutes before turning the pan upside and transferring the doughnuts onto a cooling rack. Prepare the ganache by placing the coarsely chopped chocolate in a bowl and set aside. Meanwhile, bring the coconut milk to the boil. Pour the hot coconut milk over the chocolate pieces and let it stand without stirring for 5 minutes. After 5 minutes stir the chocolate-milk mixture until it appears glossy and smooth. 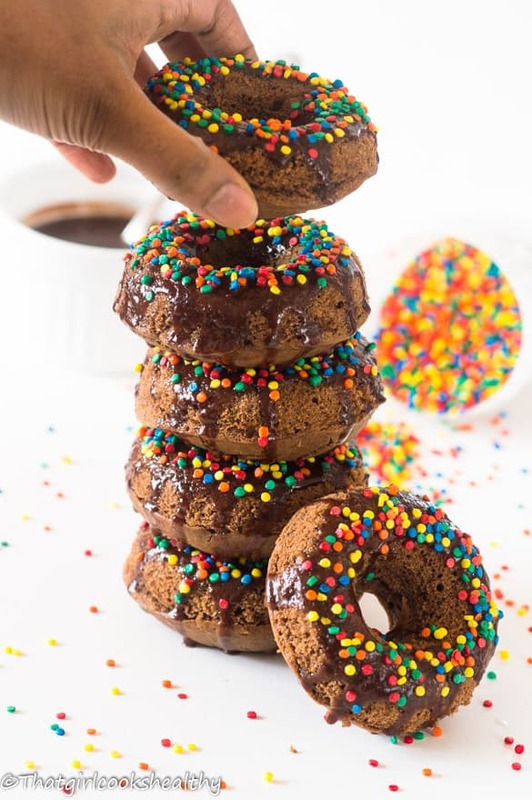 Allow the ganache to cool slightly before dipping the top half of the doughnut in one by one. Put the doughnuts in the refrigerator to set before serving. These look delicious! 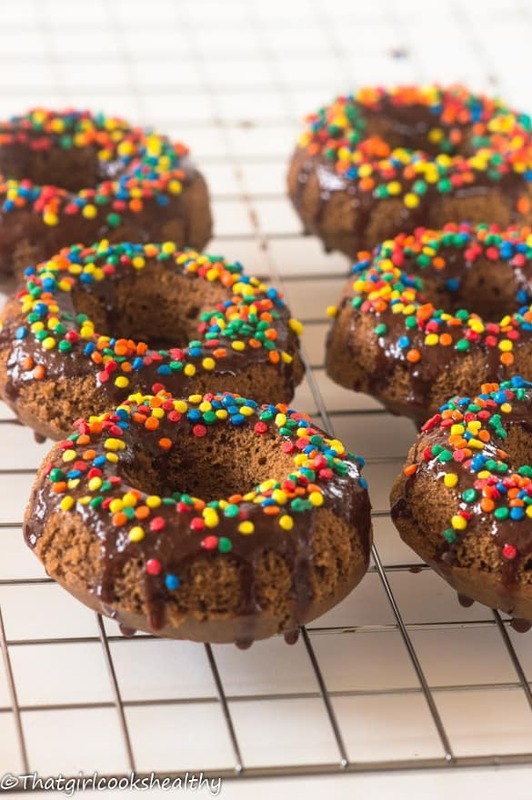 I would not have thought of using buckwheat flour for donuts! I’ve only used it for pancakes, but makes sense you could use it for donuts 🙂 I like you have an aversion to deep fried foods, they are yummy, but I don’t like to indulge in them too often. I also love that your glaze is made with coconut milk and chocolate! Great recipe! Hi Shelby, thank you. Yes, buckwheat flour is very versatile. These look wonderful. Hard to believe these are gluten free. Yes, they definitely are Peter and thank you for commenting. Would their be a change in texture if I exchange the baking powder/soda for Xanthum gum? Xanthan gum won’t be necessary as that is only used for binding flours. In this case the buckwheat flour is what holds the structure of the doughnuts. You can omit the baking powder/soda if you wish as this is only used to give the doughnuts some raise, though it’s not essential. You had me at double chocolate! These sound great! Yay! That’s good to know Sara. Ok, I think it’s time I got one of those donut pans! These look so delicious and bonus that they aren’t bad for you! Thank you Rebekah. The doughnut pan is one of my best investments I use it so often, highly recommended. Love that these are dairy free and made with buckwheat flour! They look delicious! These donuts look amazing! Im a sucker for any thing double chocolate! Thanks Bethany. Let’s eat some together. LOL Haha sure thing, with pleasure!